Nyung nä Merit Field. Painted by Peter Iseli. Nyung nä practice is an intensive 2-day purification retreat that includes fasting, precepts, prostrations, prayers, mantra recitation, and offerings. Nyung nä is a practice based on the deity, 1,000 armed Chenrezig, the Buddha of Compassion, and is extremely powerful for healing illness, purifying negative karma, and opening the heart to compassion. Institut Vajra Yogini (IVY) in France recently hosted a series of 108 nyung näs, with Lama Zopa Rinpoche sponsoring those doing the full 108. Three people completed 108 nyung näs each. Institut Vajra Yogini is hosting another round of 108 nyung näs: November 15, 2013 to June 19, 2014. For more information, please contact IVY. 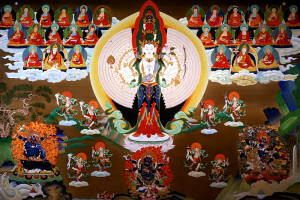 From August 9-12th, 2013, Maitripa College is hosting a nyung nä retreat, led by Merry Colony, who has personally completed over 108 of these powerful retreats herself. You can read commentary from Lama Zopa Rinpoche about this powerful practice courtesy of the Lama Yeshe Wisdom Archive. FPMT Education Services has published a Nyung Nä practice manual with everything you need to complete this retreat. It can be purchased on the FPMT Foundation Store.